Dr. Fry is a board certified veterinary internal medicine specialist who joined Elk Grove Veterinary Specialty & Emergency in 2018 and also serves as our medical director. Dr. Fry attended the University of Tennessee where she earned a Bachelor of Science degree in Agriculture, followed by a Doctor of Veterinary Medicine degree from The Ohio State University College of Veterinary Medicine in 2008. Following completion of veterinary school, Dr. Fry completed a yearlong rotating internship in small animal medicine and surgery at MedVet Medical & Cancer Center for Pets in Worthington, OH and an additional emergency and internal medicine internship at Affiliated Animal Care in Chesapeake, VA. In 2013, Dr. Fry became a board certified Diplomate of the American College of Veterinary Internal Medicine upon completion of a three-year residency in small animal internal medicine at Gulf Coast Veterinary Specialists in Houston, TX. Dr. Fry received the ACVIM Research Award for her research onVitamin B12 metabolism in dogs with various forms of hepatic disease at the annual American College of Veterinary Internal Medicine (ACVIM) conference in Seattle. After becoming board certified, Dr. Fry has worked as an internal medicine specialist at private practice specialty practices located in Nashville, Chicago, and Toledo. Dr. Fry is the author and co-author of publications in a variety of veterinary journals including the Journal of Veterinary Emergency & Critical Care, Journal of Veterinary Internal Medicine, Journal of Small Animal Practice, Journal of the American Animal Hospital Association, and Clinician’s Brief. Although Dr. Fry maintains an interest in all aspects of internal medicine, she has a particular interest in hepatic (liver), endocrine, and immune mediated diseases. When not treating patients, Dr. Fry enjoys spending time with her husband (Mitch), their two dogs (Bristol Bear and Knoxville), and their two cats (Franklin and Fiona). Dr. Cairns received her veterinary degree from Colorado State University in 2004. She completed a small animal rotating internship at Cornell University in 2005 and a small animal internal medicine residency and concurrent master’s degree at The Ohio State University in 2008. Dr. Cairns was accepted as a diplomate in the American College of Internal Medicine in 2008. Dr. Cairns offers consultations in all facets of canine and feline internal medicine, including gastroenterology, hepatology, endocrinology, nephrology, lower urinary tract disorders, respiratory medicine, hematology, infectious disease and immune-mediated conditions. She performs full diagnostic thoracic and abdominal ultrasound examinations and endoscopic procedures such as rhinoscopy, bronchoscopy, colonoscopy, gastroduodenoscopy and cystoscopy. Dr. Cairns has additional training in non-invasive procedures such as laparoscopic liver biopsy, tracheal stenting, urethral stenting and peri-urethral collagen implantation for urinary incontinence. Dr. Cairns believes in open and forthright communication with clients and referring veterinarians to foster a team approach to the health care of their pets. 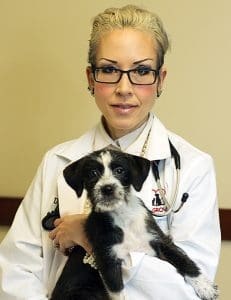 She recognizes that every patient is unique and believes in being an advocate for her clients to help them make informed decisions for their animal family members. Dr. Cairns is thrilled to be a part of the Elk Grove Veterinary Specialty and Emergency Hospital family and looks forward to building lasting relationships with the team and community. In her personal time, Dr. Cairns is an avid runner and enjoys family time with her husband, two daughters, son and two cats. Dr. Leach is a board certified veterinary medical oncologist. She received her veterinary degree from Kansas State University in 2007. She then completed an internship with VCA in 2008. She completed her residency in oncology at Purdue University in 2011 and has been in private practice since this time. Throughout her residency training, she also enjoyed working emergency, which helped to broaden her knowledge base. Dr. Leach performs a variety of diagnostics, including cytology, biopsy, bone marrow aspirate, and additional specific tumor stains to determine the most accurate diagnosis. She offers a variety of chemotherapeutic options, receptor targeted and small molecule inhibitor therapy, melanoma vaccine, and palliative treatments. Dr. Leach appreciates all aspects of veterinary oncology, but truly values the close relationships she develops with her patients and their owners. She feels that the most important aspect of any treatment protocol is that the patient either maintains or ideally has an improved quality of life. One of her early interests and publications was the use of metronomic low-dose protocols to help slow down cancer progression in patients that may not tolerate high-dose regimens or in cases where high-dose chemotherapy was not a feasible option. She enjoys spending time with her Irish Wolfhounds, Emmet and Ronan. She has found volunteering for various associations, including pet therapy programs at hospitals and assisted living facilities, very rewarding. She enjoys exploring the city with her friends/family, gardening, and caring for her Oscar fish, Ringo and George. Dr. Nick Miller is a 2008 alumnus of the University of Wisconsin School of Veterinary Medicine. He honed his skills in managing acute injuries/illness and challenging internal medicine cases during an emergency internship at Wisconsin Veterinary Referral Center. He has been practicing emergency and primary care medicine in Chicago and the surrounding suburbs ever since. He recognizes the importance of the bond between pets and their people and strives to provide clear explanations of complicated medical conditions, reassurance and support in the midst of stressful situations, and compassionate, attentive care. In his free time, Dr. Miller enjoys spending time with his wife and two young daughters, exploring the outdoors with their two family dogs, playing the piano or listening to classical music. Dr. Ashley Covington is a 2014 graduate of The University of Illinois – College of Veterinary Medicine and obtained her Undergraduate degree from the University of Illinois. During her internship with Blue Pearl Veterinary Partners in Illinois she found cases involving wound management and toxicology to be her calling and an area she truly excelled at and enjoyed. Dr. Covington is an active member of the Illinois Veterinary Medical Association and Veterinary Emergency and Critical Care Society. Veterinary Medicine has been Dr. Covington’s career choice since the day she was born. Ashley enjoys the fast paced environment and the variety of cases that are seen in a specialty & emergency setting. On her rare off time away from the hospital, Ashley will be found doing a plethora of activities ranging from trapeze, cross-fit, rock climbing, hiking and traveling. Dr. Covington’s family consists of 2 dogs named Enzo & Fiona and a chinchilla named Gus. Dr. Herbert graduated from Iowa State College of Veterinary Medicine in 2002. She completed a rotating small animal medicine and surgery internship at Michigan Veterinary Specialists the following year and has been an ER doctor in the Chicagoland area since that time. In her free time she enjoys spending time with her family and participating in endurance events. Dr. Jennifer Blake received her doctorate of veterinary medicine with honors from the University of Illinois in 2007. After graduation, she completed an internship at an emergency and specialty hospital in the Chicago area. She continued practicing as an emergency veterinarian and also received certification in small animal ultrasonography through the University of Illinois. After adopting a Newfoundland, Argus, with multiple orthopedic issues, she also developed a passion for integrative and rehabilitation medicine. Dr. Blake is certified in acupuncture through the Chi Institute and is a Certified Canine Rehabilitation Therapist through the Canine Rehabilitation Institute. In her spare time, she enjoys spending time with her family and friends. She also enjoys reading, traveling and will begin attending sculpting classes. Dr Gregory Chernok is a 2006 graduate of the University of Illinois – College of Veterinary Medicine and obtained his undergraduate degree from California University of Pennsylvania. He has been practicing in both emergency and primary care medicine since then. Dr. Chernok enjoys the fast paced environment of ER but also finds challenging medical cases exciting. In his spare time, Dr.Chernok enjoys spending time with his wife and their three English Bull Terriers, traveling to Disney World, going on Disney cruises, off-roading in their Jeep Wrangler, skiing, and shooting pool.